1) They are one-of-a-kind! 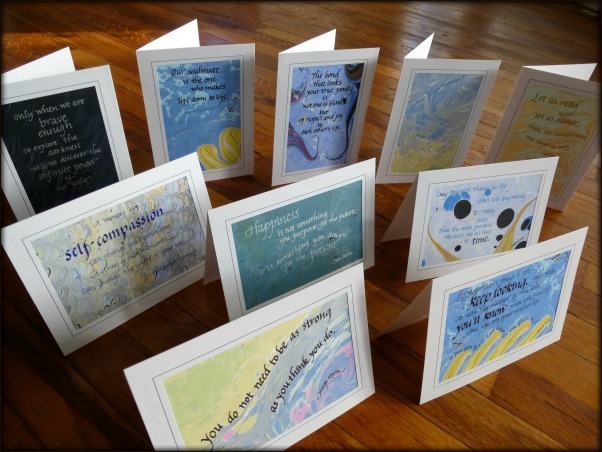 Each card features an original piece of marbled paper with hand-lettered script. No two are alike. It doesn’t get more original than that! 2) They are ready-to-frame! Each note card acts like a mat, is signed by Amy and me, and fits into any standard 5 x 7 frame. It’s like getting two things for the price of one: a note card and a frameable piece of art! 3) The quality of the paper! When you feel the note cards in your hands, you know you’re holding something high in quality. The environmentally friendly cards are made from recycled card stock and are printed with a soybean-based ink. The end result is a richly textured matted frame that perfectly complements the marbled paper. 4) Affordable art! Note cards are only $6.50 each (plus shipping and tax, where applicable). How often can you say you got a one-of-a-kind, high-quality, ready-to-frame, signed piece of art for that price?! Head on over to the Note Card Store to see more options. If you're interested in purchasing any, email me (Cheers “at” BarbSkoog “dot” com) and I'll set the order up for you.